This is my third slave narrative and my fourth book about American slavery, this year. Slavery is never an easy topic to read about; however, Up From Slavery is actually extremely encouraging and inspirational. 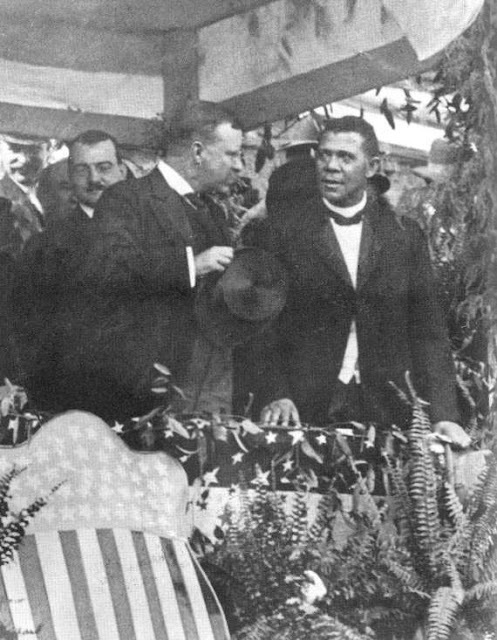 The short version of Booker T. Washington's life is that he was born into slavery and was under age ten when slavery ended. After the Civil War, he moved with his mother and brother to the North. As a young boy, Booker worked to earn money for the family, but what he desired most was an education. Even in utter poverty and unimaginable hardships, he found a way to go to school and gain knowledge. At school, Washington proved himself a hard worker and dedicated student that he was recommended to open a new school in Alabama, which would become the Tuskegee Institute. He remained the leader and representative of Tuskegee until his death in 1915. Tuskegee would become his life work. He literally built and expanded the school with his bare hands, along with students. He made it his responsibility to secure donations or loans from wealthy individuals and politicians to purchase the land, buy supplies, and furnish the school. The students provided all of the labor because he wanted to teach that there is dignity in merit, industry, and labor. At the time, ex-slaves believed education (book learning) was the way to avoid hard labor, but Washington wanted them to learn the value of building, creating, and making something worthy and necessary with their own hands, something they could use personally or to sell because there was a demand. In turn, students learned a skill, which they were good at and could earn an income. He taught them how community works. if Congress wanted to do something which would assist in ridding the South of the race question and making friends between the two races, it should, in every proper way, encourage the material and intellectual growth of both races. Washington was also worried that the Republicans were pushing too quickly on the black community to get involved in politics when he knew they were not prepared to be in office. He believed the Republicans were using the blacks to gain power in the South, which is very probable, and Washington was more concerned with the moral and intellectual stability of the black race, first. He also said that the generation he was teaching now would need to understand that they were laying the foundation for their future children and grandchildren, that they "could grow to higher and more important things in life." In other words, they were going to have to start at the bottom and work their way up. They could not expect to begin at the top. No race can prosper till it learns that there is as much dignity in tilling a field as in writing a poem. It is at the bottom of life we must begin and not at the top. Nor should we permit our grievances to overshadow our opportunities. 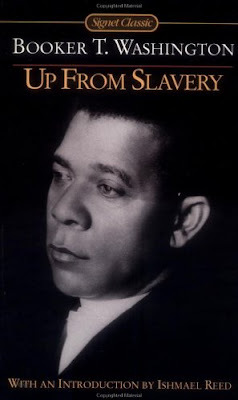 I understand now why Booker T. Washington was and still is called an "Uncle Tom" by other blacks: because his ideas and policies were and are passive and conservative. He was eager to see the races equal and did not argue for the "rights" of the black race. He rather show through hard work, dedication, industry, and education that the black race is worthy of respect and has a place in society. He wanted to demonstrate that, if given the opportunity, blacks would contribute to their community and prove to be worthy. He had a positive vision for his people and for the nation and its future. If this had been the only book I ever read about slavery, I would have thought that the issue of racism was done and over with in America, since Booker T. Washington's time. He highlighted how eager wealthy, white people were to work with or support him in his endeavors, which is why he believed that people would reward merit and that rich people would always support good work someone else was doing. But what happened to Washington's ideals? What happened to his vision? What happened to his America? 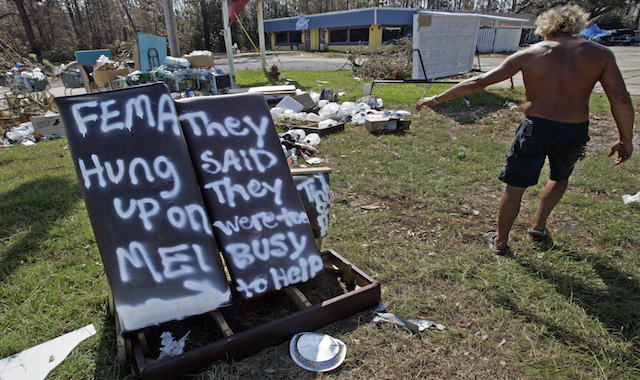 This reminds me of a story: Hurricane Katrina hit the Gulf Coast in 2005. The city of New Orleans, which is already below sea level, was in danger. The Mayor had issued a mandatory evacuation order, but for whatever reason, many stayed behind. When the hurricane was over, the levies (which protected the city from the sea) broke, flooding the city. (No, President Bush did not blow up the levies). Many people fled their flooded neighborhoods to get to the Superdome, which had been open to the public, but had remained surprisingly empty during the storm. And for another unknown reason, the Superdome WAS NOT STOCKED with supplies or resources. THE CITY WAS NOT PREPARED! People thought they would spend a few hours through the storm and then it would be over. But that did not happen. When crowds of helpless, tired, sick, elderly, hungry, frightened, angry people showed up at the Superdome at the same time, it was pure chaos. This lasted for three days! This was frustrating to watch on TV. When buses arrived at the Superdome, they took 150,000 people and transported them to Houston, Texas, where many of them would start new lives. Instead, I thought, why not find a way to keep the people in the area? Louisiana could not accommodate her own people? Why not have them rebuild their city? After all, the media was talking about how they were all out of work (especially now). Work? There would be so much work to be done; someone was going to have to do it. And what about all of the people who remained, only to live in FEMA trailers for YEARS and YEARS, waiting for someone else sent by the government to rebuild their home? Really? If we learned anything, it is that government fails us on these levels. How much faster could we get it done ourselves if we could be proactive and involved, instead of waiting for [government] to do it for us? 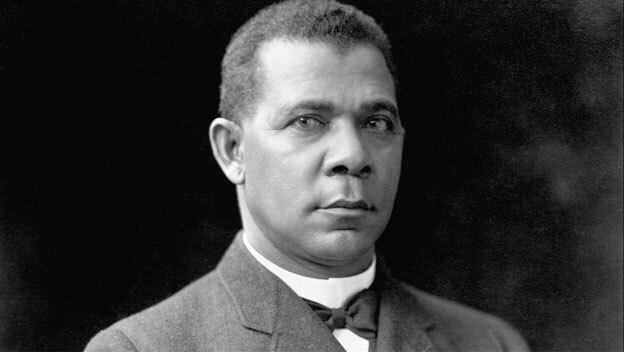 If Booker T. Washington were alive today, he would have advocated that all of the capable people rebuild their homes, their churches, their neighborhoods, and their community. He would have rolled up his sleeves to work, too, instead of waiting for government. Imagine the lessons that would have been learned. Imagine the skills gained. Imagine the sense of accomplishment. Imagine the new lives built up after such suffering. 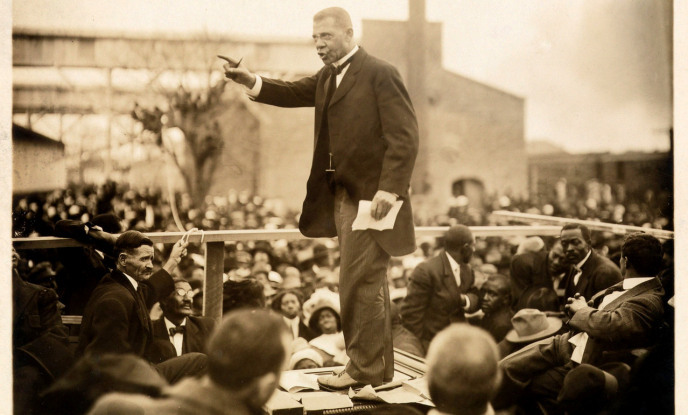 Booker T. Washington was an insightful, optimistic, brilliant leader. America could sure use more leaders like him. One of my favorite books. I made my three boys read this before they could graduate from my high school. The hard work principle plus the value of education was a worthy message. It sure is. Like a breath of fresh air. Today's attitude is more of one of automatic entitlement. I've wanted to read this for years -- thanks for the reminder to add it to my written-down TBR list!!! Oh, good. It's an easy read, too. I loved this book when I read it back in high school! It's incredibly inspirational. Isn't it? I love it, too. Great review, Ruth, I should read this. B.T. Washington is my kind of guy! Everyone should be encouraged by Booker T. Washington. He truly is a leader and an inspiration. I absolutely LOVE Booker T. Washington. What a man and what an example to us all. I did not want this book to end. Definitely my favourite of all the three slavery books we've read, in that it gives practical ideas to move forward for everyone. And great review, BTW. I'm going to link it to my own ------- because I was so moved by this book, my review is turning into an emotional sort of leap-frog, replete with quotes, quotes, and more quotes. There were so many amazing quotes in this book that I don't think I've ever underlined so much in my life! Yay! You should include images of the defacing of your book. I cannot wait to read your review.